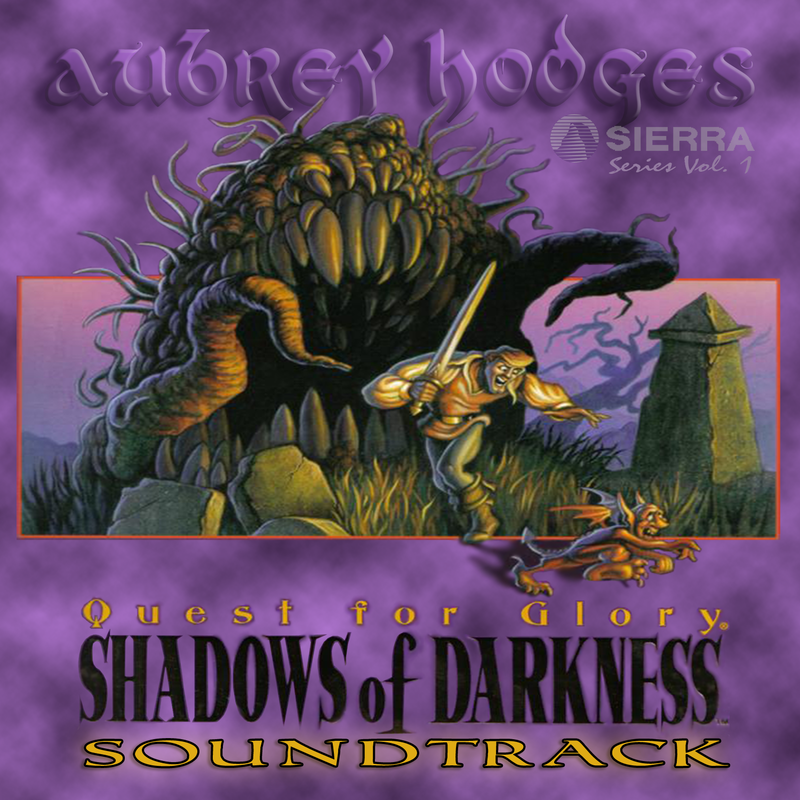 Being a fan of Sierra adventure games and game soundtracks in general, I was ecstatic when I heard the news that Aubrey Hodges, a composer for many of Sierra's games during the 1990s, was going to remaster the soundtrack to Quest for Glory IV: Shadows of Darkness and sell it on his bandcamp site. I loved all the Quest for Glory soundtracks since they all managed to have their own distinct styles; Hodges managed to bring together a mix of rock (complete with wailing guitar solos) and traditional, Slavic sounding pieces – it's a mix that works surprisingly well. The rock music is mainly used during the battle sequences, I guess to help get the adrenalin pumping, but you'll also hear the electric guitar for peaceful themes such as "Erana's Garden". I guess the only problem with the original soundtrack (if you could call it a problem) is that it was all done in the MIDI format which means no live instruments; this of course, is why Hodges has created this new album. There's a whopping 100 .mp3 tracks on this album so you're probably immediately thinking it's going to receive a low score as this is what happened when I reviewed the Skyrim soundtrack, which similarly had a lot of tracks. Why do albums with lots of tracks tend to score lower on Choicest Games? It's because albums with lots of "filler" or "ambient" tracks tend to do poorly and if you have an album with lots of tracks, there's a high likelihood many of those tracks are going to be ambient pieces. Thankfully, the Quest for Glory IV soundtrack has very little in the way of ambient tracks with almost all of the tracks containing a melody of some sort. There's also a lot of duplication (at least in terms of a general tune) as many tracks are remastered tracks despite the originals also being included. You see, 42 out of the 100 tracks are new, remastered tracks using live instruments while the remaining 58 are recordings of the original MIDI tracks but played back through a high-end sound card (a Sound Canvas I believe). So if I enjoyed the original MIDI soundtrack, there's a good chance I'll like the remastered tracks too. Overall, the remastered tracks tend to be superior to the originals especially ones that have taken advantage of a live electric guitar to replace the MIDI equivalent. Notably good examples include the Main Theme - Soundtrack Version (Real Instruments), Battle: Necrotaur - Soundtrack Version (Real Instruments) and Erana's Garden - Soundtrack Version (Real Instruments). There are a couple of exceptions though such as Battle: Wyvern - Soundtrack Version (Real Instruments) where the samples sound a bit scratchy earlier on and Thieves' Guild - Soundtrack Edition (Real Instruments), which despite being a pretty cool and jazzy piece, you can have too much of a good thing, as it drags on for way too long (obviously Hodges had a bit too much fun making it!). I also question why there was the need to remaster Hero's Death and Win Battle since they're only a few seconds long. While a good majority of the remaining tracks (which are basically recordings of MIDI tracks played through a Sound Canvas) sound as good as you'd expect MIDIs to sound, there were a few tracks that sounded a bit discordant such as Dr. Cranium's Hallway - Game Version, Dr. Cranium's Laboratory - Game Version and Battle: Revenant - Game Version (so these tracks definitely benefited from being remastered). I also noticed there were quite a few tracks which I thought deserved a remaster but never made the final cut such as Meeting with Katrina, the Gypsies Medley and the The Burgomeister (how good would it have been to have something akin to the Red Army Choir singing his tune?). Amazingly, despite this being such a huge album (100 tracks) there's actually very little in the way of filler or ambient tracks. I guess this is partly due to how the Quest for Glory games were designed and partly thanks to how talented Aubrey Hodges is in composing a soundtrack that encompasses many styles of music that can fit any occasion. While it's great to hear the old MIDI tracks using an upmarket sound card (well, most of the time), it's even better when you hear the remastered versions with live instruments, especially on the electric guitar! A must-buy for the QFGIV, Sierra and VGM fans! If you're interested in purchasing the soundtrack, it's available in digital format for $15 USD from Hodges's Bandcamp page.